Let’s go again to investigate all the romantic places Italy can offer! And this time we can go definitely and proudly south: we start with the Gargano Promontory which offers you a romantic environment with many interesting things to do: the sea with many golden beaches, the lovely Foresta Umbra National Park with the hiking trails, the little and exquisite lakes, all the medieval towns with the lovely historic centres, and gorgeous food. relax with your lover along the Gargano coast and smell the natural “parfume” coming from the citrus groves and olive trees. Go on a romantic and rustic treat in one of the manifold masseria, the name for “country house” in Apulia, such a lovely place to stay over. Masserie could be rustic but also a luxurious lodging houses: working farms producing olive oil, wine, tomatoes in countryside settings. Visit the Masseria coast, from Bari to Brindisi or in the Salento Peninsula (south of Lecce). 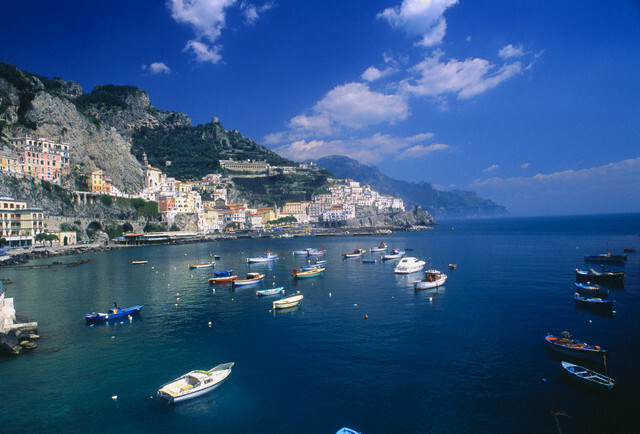 Then, on the opposite coast, the astonishing Campania and with Positano on the Amalfi Coast, one of Italy’s most well-known destinations. The town is literally built vertically on the face of a cliff! The views of the sea is amazing from the top, in particular on the “terrazza” of the various local little restaurants where to buy a fantastic seafood meals. And you can go to Positano all the year round! The island of Capri is the “capital” of the romantic views, starting from its secluded caves and cliffs of a stunning beauty. Going really south again we find a romantic island, Sicily, and Taormina, one of the top travel destinations since the 19th century thanks to the Grand Tour. We will climb on the side of Monte Tauro, to get in the town and enjoy the romantic views of the Sicilian coast! And again a unique view from Taormina shapes under your eyes: Mt. Etna volcano. Below the town exceptional, golden beaches are waiting for you. And now back to the city in the medieval quarter, to kiss happily in the castle ruins or admire a sightseeing in the Greek theater, Taormina amphitheatre, still used nowadays for summer performances. This entry was posted on Tuesday, July 3rd, 2012 at 7:07 pm	and is filed under Discover Italy. You can follow any responses to this entry through the RSS 2.0 feed. You can leave a response, or trackback from your own site.